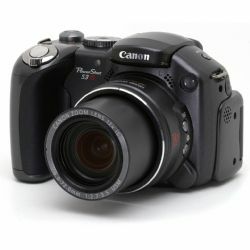 A complete line of Canon Powershot S3 IS accessories! You can find a full range of Canon Powershot S3 IS accessories such as Canon Powershot S3 IS batteries, Canon Powershot S3 IS cases, Canon Powershot S3 IS flashes, Canon Powershot S3 IS chargers, Canon Powershot S3 IS lenses, Canon Powershot S3 IS filters and a complete line of lens adapter, shutter releases, underwater housings, and memory cards for your Canon Powershot S3 IS camera. The Canon PowerShot S3 IS incorporates a professional quality 12x Optical Zoom Lens, 6.0 Megapixel CCD sensor, Canon's renowned optical Image Stabilizer technology and video functionality rivaling that of dedicated digital video camcorders. Sporting a striking finish in gunmetal grey, the Stylish and compact PowerShot S3 IS answers the demands of advanced photographers with several improvements over its predecessor, including an increased sensitivity range of ISO 80 to ISO 800, a larger 2.0" vari-angle LCD screen, widescreen (16:9) recording, improved movie features and an additional Sports mode. B + W 58mm Kaesemann CIRCULAR Polarizer Filter in Wide Angle Slim Mount, MRC Coated glass.